November 4th, a ballot measure in Aurora, Colorado that would have repealed the ban on dogs who are over 50% “pit bull” failed to pass. On the surface, this seems to be a disheartening loss. A lot of hard work was put into educating the public about the ban on a shoe string budget, and hopes were high that this would be the first repeal to happen by popular vote. Ballot measures of any kind are complex creatures, with many factors contributing to the outcome. It was an uphill battle from the start, but, when the bottom line is examined, we come away with a message not of failure, but of hope and success. The first issue advocates for breed neutral laws had to contend with was the time frame. The ballot was brought up for discussion by the city council 2 months before they officially created the measure. City council must vote to put an issue on the ballot and the language of the ballot. This means that groups in the area had a scant 90 days to develop and deliver their message. Repeal had been a long running discussion in the community. The issue had seen some significant media coverage even before the ballot came up. The media and council were told by Aurora Animal Control that the ban was working and that bites in the community had been reduced, though they neglected to provide any data. The actual data, obtained via a request to the city attorney, tells a very different story. A detailed analysis of the data from Brent Toellner, KC Dog Blog, shows the same story that is clearly illustrated in the above chart. Bites have increased in Aurora, overall, by 77% since the bans inception (details provided in the link). This pivotal fact was neglected by every single media outlet that reported on the issue. It is very clear that animal control was presenting “facts” to support the ban, instead of those that would inform the public. Not only was Aurora Animal Control playing the part of spin doctor to cover the bans failure at protecting residents, they have also failed at breed identification. Aurora is one of the few places where DNA testing is codified in the law. Because of this, we can see exactly how good animal control is at the job of identifying “pit bulls.” 76% of the time, dogs being targeted under the ban are not covered under the wording of the law. 76% of the time, resources in the form of man hours and money are wasted on dogs that are unlucky enough to look the part. This information was also readily available via the city attorney’s office, but, yet again, both animal control and the media neglected to mention, even once, how abysmal the breed identification track record is. In the 90 days before the ballot due date, local groups conducted a grassroots campaign to inform the public about the ballot and the ban. Director of ColoRADogs, Nancy Tranzow, stated that many people believed the ban only affected dogs who were actually vicious, and were unaware that dogs that had done nothing wrong were being confiscated and killed. When it was explained how these laws impact innocent families, many people changed their opinion of the ban. The issue of property rights did not seem to affect opinions, stated Tranzow. This stands out because according to a focus group conducted by Luntz Global, at the behest of Best Friends Animal Society, the issue of property rights featured strongly as one of the most effective arguments. So what happened with the ballot itself? Aurora operates mostly on mail in ballots and voters are responsible for postage. The language of the ballot was deceptively simple. “Shall the people of Aurora adopt an ordinance allowing pit bulls back into their city?” This would appear to be a good thing, particularly after the issue of the Miami ballot measure language, which was so confusing many people claimed they voted the wrong way. Experts on the legislative process and ballot initiatives say otherwise. Many point out that overly simple language on a complex issue leads people to make uninformed decisions. So instead of opting out of voting on something they are not familiar with, a person will vote based on “feeling, not fact” as Councilwoman Molly Markert so aptly put it. “It’s not about a fact, it’s about a feeling.” Should public safety be about a feeling? This question should not even have to be answered. The answer should be so self-evident that the question would never have to be asked. Unfortunately, Aurora finds itself at the mercy of feelings and not facts. The beautiful thing about facts, however, is that they always win out in the end. -Aurora’s ban had not reduced attacks. -Those tasked with the implementation of the ban cannot identify what they are trying to keep out of their community and yet they continue to insist this thing they can’t identify is much more dangerous than other dogs just by being. -Informal polling in mid-September showed only 24% of people were for the repeal and (according to the count at the time of this posting) 35.2% actually voted to repeal. This percentage increase in the span of roughly 45 days is remarkable. Though some pro-BSL blogs are saying that the vote was 22,719 to repeal the ban and 92,898 to keep the ban, this is untrue. The official count for the measure at the time of this post is 34,284 votes for repeal vs 62,953 against. These numbers have changed several times, with the number of votes for repeal, creeping up steadily. Polling roughly 45 days before the vote showed 24% for repeal. That turned into 35.2% of voters for repeal. This is something that should be highlighted. There were 90 days to reach a community of almost 350,000 people, a part of which had no idea that there is a ban in place. In 45 days, advocates increased support for the repeal and not only increased support, but increased the number of people who were willing to vote to change it in a quantifiable way. Fact, not feeling. The repeal failed. This is a fact. It is also a fact that education works to change minds. It is a fact that the people working for the repeal were effective in their methods. They worked professionally and ethically in the face of bullying, cyber stalking and harassment by the out of state pro-BSL lobby. They worked diligently in the face of childish name calling, liable and blatant bigotry against them as individuals by so-called victims advocates. They stood up and spoke up for the betterment of the community and they most certainly are not stopping just because feeling won this round. This entry was posted in Uncategorized and tagged aurora colorado, ballot, ban, BDL, breed discriminatory legislation, breed specific legislation, BSL, pit bull. Bookmark the permalink. Anyone know what is considered a “pit bull” under Aurora’s ban? Just wondering because my dog is 75% American Staff, but the rest of him is a mish-mash of other dogs as determined by DNA testing. Would he qualify as a pit bull as he is not any sort of purebred dog, or is it based on a certain percentage, a certain set of physical characteristics, etc? I mean, I know that’s the constant issue with these sorts of laws, and what makes them inherently ineffective, difficult to enforce, and based on fear of a look over true aggressive genetics of any kind….but I’m just curious in the case of the DNA testing aspect of the law as mentioned here. 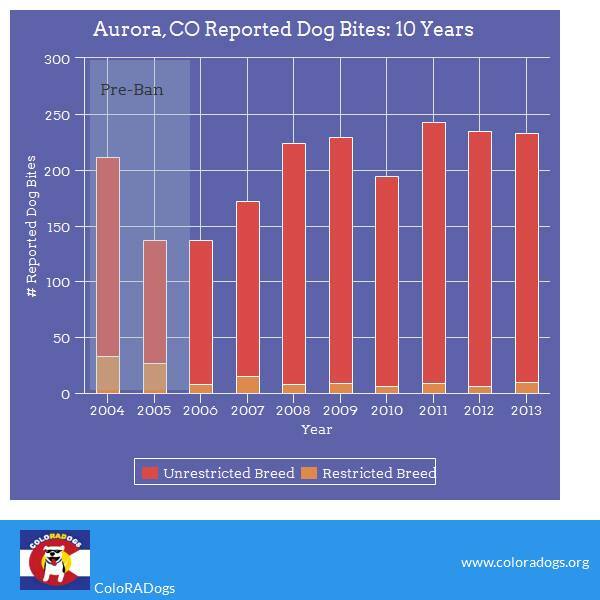 Yes, your dog would fall under the ban in Aurora at 75% American Staffordshire Terrier. It is based on percentage of 3 breeds, American Pit Bull Terrier, American Staffordshire Terrier and Staffordshire Bull Terrier. 50% and less of any of the 3 breeds is not a banned dog. Anything over 50% is. 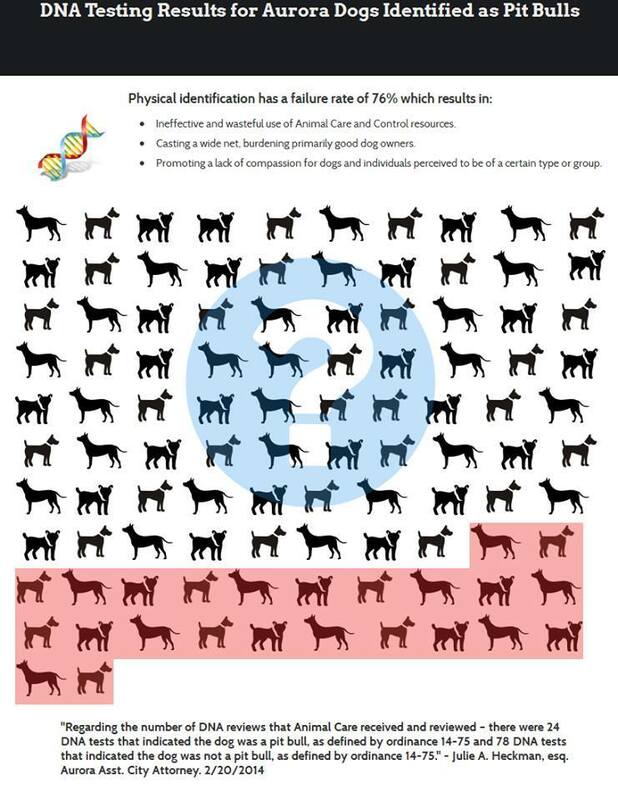 The DNA testing issue is something else entirely since using the Wisdom Panel for law enforcement is strictly against the Mars TOS, but since they can’t ID dogs visually, the instituted the DNA. There was too little time. The second round certainly will. Was the original BSL policy/ban created and approved by the city council, or was that also put to a public vote? If it was a unilateral decision by the council, without a public vote, why could they not also rescind the ban without a public vote? I can imagine why they wouldn’t repeal without the vote, since they would only see downside, whereas I suspect that they only saw upside with putting the ban in place. Overall, my opinion is that the council lacked credibility and leadership with how they handled the ballot measure. They should have listened to reputable sources to gather factual data, then made a decision after soliciting feedback from constituents. There’s a reason that in elections, incumbents in lower level and lesser visible positions continue to get re-elected – people don’t take the time to get educated on a topic, so they vote status quo. The council should not take the outcome of the BSL repeal as an educated position put forth by their constituents, but more of a “I’m not sure, so I’ll just check a box for no change”. Back to my original question – if the initial decision for BSL was council mandated, then they severely handicapped efforts at any repeal. One could go so far as calling that dirty politics and manipulating process. One last statement – no way Aurora would get a majority vote to approve recreational marijuana sales within city limits, but they did it anyway. Why? Cash. Logical or hypocritical?? The original ban was put in by the city council in, I believe, 2005. The ban covered 10 other breeds that were then removed in 2011. They could have repealed without a popular vote, but instead of doing that they put it on the ballot. Speculation is that they felt that if the measure failed they wouldn’t be able to bring it up for another 10 years, but that is not true at all. So dogs that are <50% 'pit bull' are welcome in Colorado? They suddenly become dangerous when they creep over 50%? Do Politicians not realize how idiotic that sounds? Repeals should be based on Facts/Science not on a vote. It seems to me that Legislators just passed the buck here to Voters because they didn`t want to make a decision based on Science. The ignorant and those who fearmonger should not be setting Policy. Not Colorado, Aurora, CO, specifically, but yes. Dogs that are 50% or less “American Pit Bull Terrier, American Staffordshire Terrier and Staffordshire Bull Terriers” are completely legal. This vote was about 1%. The state of Colorado has a law that prohibits breed discriminatory laws, but Denver sued and opened an exception for home rule cities to enact these laws. Thus far, none have chosen to exercise their home rule to enact a new law. Well I’d like to suggest to Canadians opposed to BSL that they keep themselves & their $ out of Aurora & perhaps the entire State of Colorado. We’d appreciate it if Americans would return the favour & stay out of Ontario.